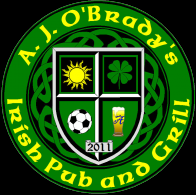 In March of 2011 a Wisconsin based company, Pubs America, Inc., opened the business as an Irish Pub and Grill under the name A. J. O’Brady’s. General Manager and Pubs America COO, Bruce Russell along with Pubs America CEO, Ed Campbell have rebranded the business as both an Irish Pub and Sports Bar. A. J. O’Brady’s offers the area’s best food and atmosphere, along with big screen viewing of the most exciting sports action around. Carrying on over 100 years of tradition in downtown Menomonee Falls.